This entry was posted in Outreach and tagged House United, outreach on December 18, 2013 by Wire Eagle. AUBURN UNIVERSITY – Auburn University and the University of Alabama are collaborating with Habitat for Humanity to build homes for Alabama residents and this week united to complete a home in time for Christmas for a Lee County family. 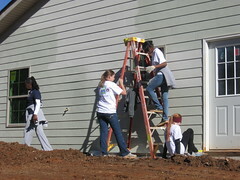 Students and staff from both universities are working with homebuilders from Geordan Communities and staff from Lee County Habitat for Humanity to provide the finishing touches necessary to prepare the home for the family to move in before Christmas. This entry was posted in Students and tagged College of Sciences and Mathematics, outreach, Students on April 11, 2013 by Wire Eagle. AUBURN UNIVERSITY – Thanh “TJ” Nguyen, a senior in mechanical engineering at Auburn University, has received the National Student Employee of the Year Award from the National Student Employment Association. The award was presented to Nguyen April 9 at a reception for the nominees at The Hotel at Auburn University and Dixon Conference Center. Nguyen is employed by the Outreach Office of the College of Sciences and Mathematics, where he has served as technical director for the War Eagle BEST robotics program and counselor for the Science Matters summer program for children. He is responsible for maintaining technology for the office and has created user manuals for new equipment. He was nominated by Mary Lou Ewald, director of the Outreach Office. This entry was posted in Campus Announcement and tagged Faculty, outreach on May 20, 2011 by Wire Eagle. Chippewa Thomas, an associate professor in the College of Education, was recently named Auburn University’s director of faculty engagement in the Office of the Vice President for University Outreach. As director of faculty engagement, Thomas will ensure faculty members have detailed and accurate information regarding outreach requirements as part of the tenure and promotion process. She will also work to develop incentives designed to increase Auburn’s outreach initiatives and will share information about collaborative projects with members of the university’s leadership team as well as the university at large. She will report to the assistant vice president for university outreach. This entry was posted in Community, General News and tagged outreach on August 31, 2010 by Wire Eagle. AUBURN – The entire senior class at Loachapoka High School is receiving HP netbooks as part of an innovative partnership between the school and Auburn University’s Outreach office. The initiative provides academic support and mentoring to help students enter and perform better in college, and ultimately qualify for better jobs. The distribution of 100 netbooks, coordinated by Auburn’s Office of University Outreach with the Lee County School System, is being conducted for the first time this school year. Funding for the netbooks is part of a grant received by University Outreach from the State Farm Youth Advisory Board to develop this college prep initiative. The mini-laptops are part of a wide range of educational enrichment opportunities now available to the students at Loachapoka.